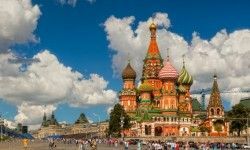 If you are planning a holiday in Moscow and St Petersburg and seeking more independence, our tailor-made tour to the two Russian capitals is what you need! Develop an understanding and appreciation of the two capitals of Russia which would remain impossible without experiencing them in person. 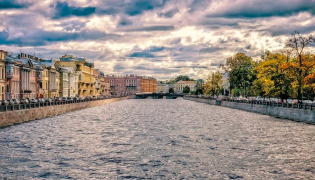 Embrace Moscow for its intriguing history and spectacular architecture and St Petersburg for its sparkling waterways and unrivalled elegance. 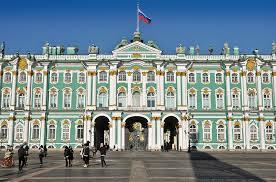 The enigmatic capital, Moscow, and its younger sibling, the graceful St Petersburg, are without doubt two of Russia’s greatest possessions. 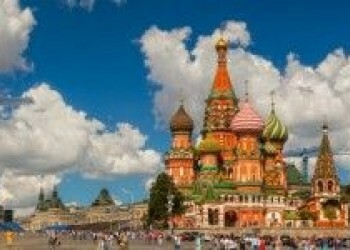 With hotels, train tickets, airport and train station transfers as well as full Russian visa support already included, you can design your own package by simply adding a few exciting excursions! 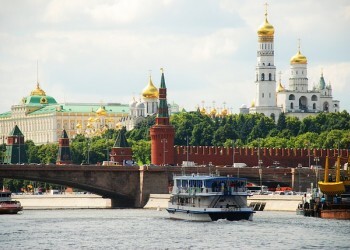 A truly iconic, global city, Moscow is the 860 year-old capital of Russia. There are dozens of reasons to come. Being one of the most breathtaking capitals in the world, Moscow has a wide range of cultural landmarks. We suggest exploring them all. Moscow has one of the best theatre production companies in the world – the famous Bolshoi Theatre. It is a symbol of Russia for all time. It was awarded this honour due to the major contribution it made to the history of the Russian performing arts. This history is on-going and today Bolshoi Theatre artists continue to contribute to it many bright pages. 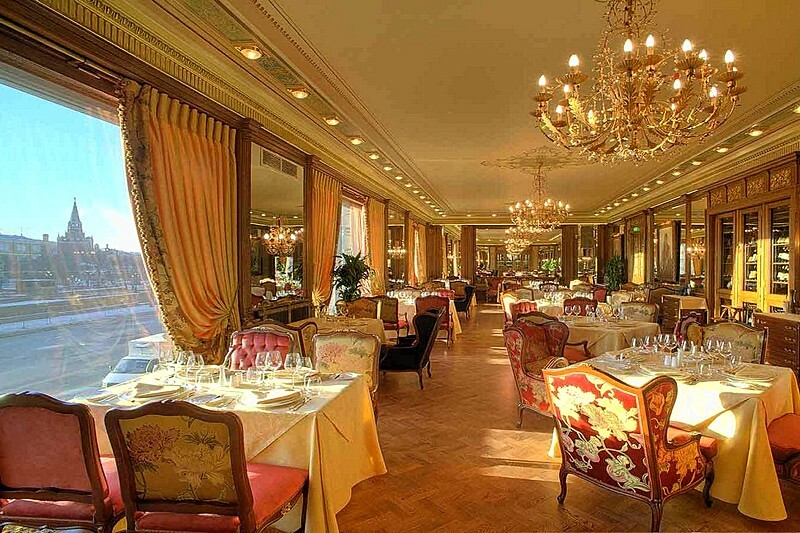 Get in touch with our Destination Experts to order tickets for one of its illustrious ballet and opera performances. 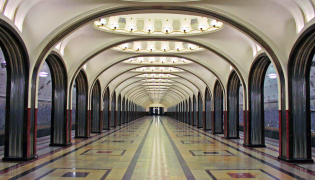 Intricately decorated, the Moscow Metro is an immense museum in itself. 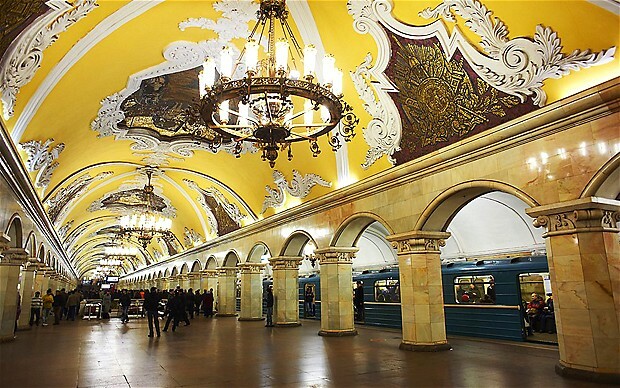 Your guide will lead you on a tour of the most magnificent stations, adorned with marble, mosaics and chandeliers. 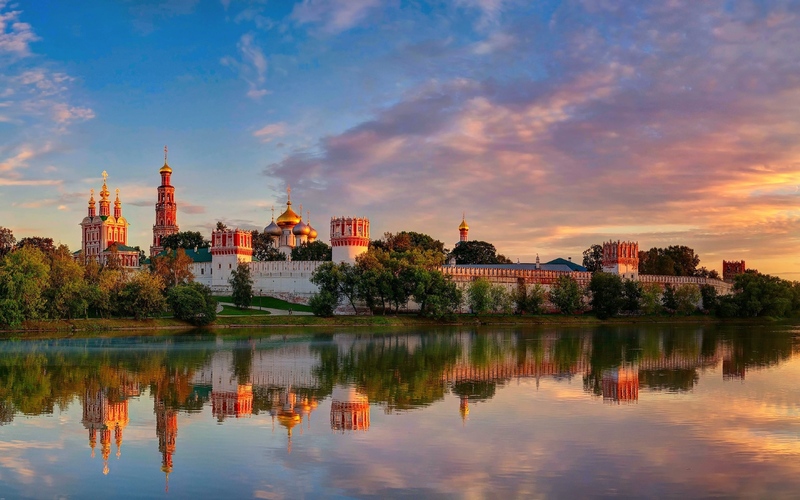 Located on the banks of the Moskva River, Novodevichy Convent is one of Moscow’s most renowned historical sites. Built in the 16th century, the architecture of the convent is that of ‘Moscow Baroque’ style and offers a serene retreat from the lively city centre. The convent is home to several churches which are surrounded by a high wall with 12 watch towers. Our guides will bring the convent to life with stories of its past. The necropolis is a must see – many of the country’s famous public figures are buried here, including writer Anton Chekhov and ballerina Anna Pavlova. 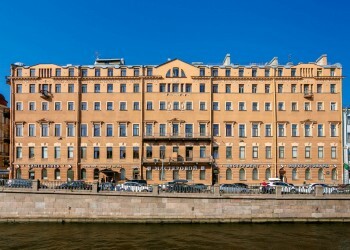 Named after its founder, Pavel Tretyakov, this gallery is one of the greatest museums in the world and is a must see for art lovers. 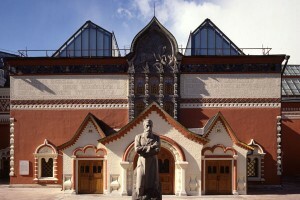 The Tretyakov Gallery is made up entirely of Russian art and contains more than 130,000 displays spanning from the 11th century to the early 20th. Our knowledgeable guides will take you to the most popular exhibits and will inform you about the artists and the pieces themselves. What to do in Moscow? 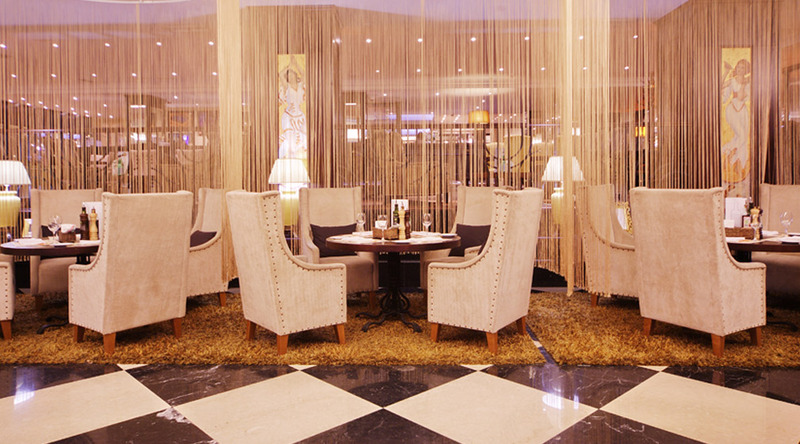 On arrival in Russia’s capital you will be met by our driver and transferred to your hotel. Relax or begin your adventure with independent exploration. ration. We recommend familiarising yourself with the city on a city tour of Moscow. 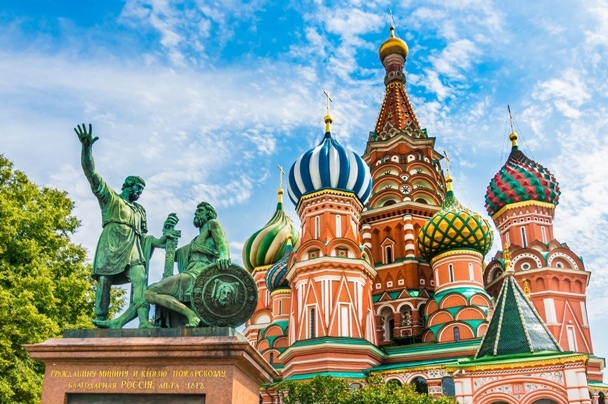 You can either pick a walking city tour, during which you will see the main attractions of the city centre such as Red Square with the magnificent St Basil's Cathedral, The Kremlin, Alexander Gardens, The Bolshoi theatre and much more! 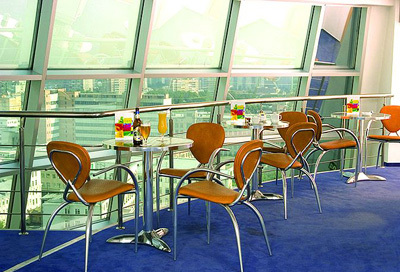 Alternatively, you can opt for a car city tour with photostops where you can also see some of the famos Seven Sisters (skyskrapers), Sparrow hills and other attractions of the city away from the city centre. 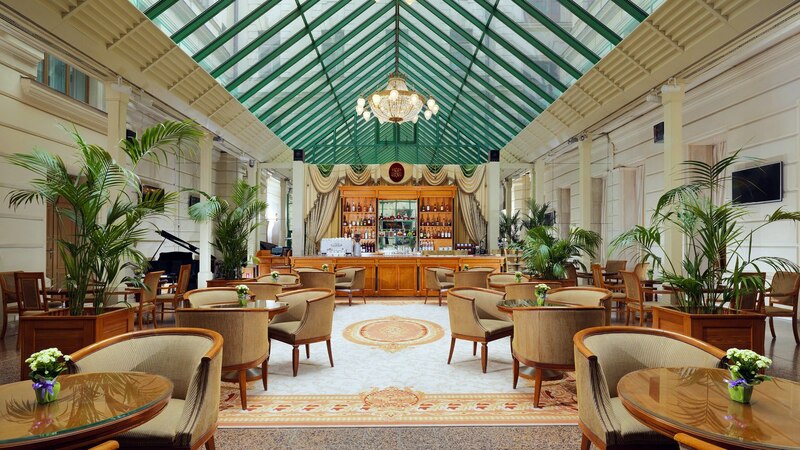 Fancy a day trip to see the surroundings of Moscow? Why not pay a visit to Gorki Leninskie where Lenin spent his later years or Sergiev Posad with its awe-inspiring churches and cathedrals? 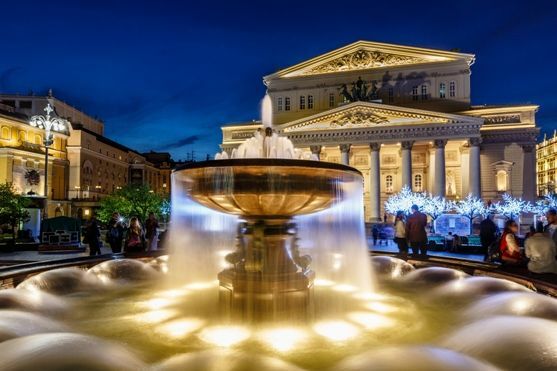 In the evening you can enjoy a balley or an opera in the world-famous Bolshoi Theatre. 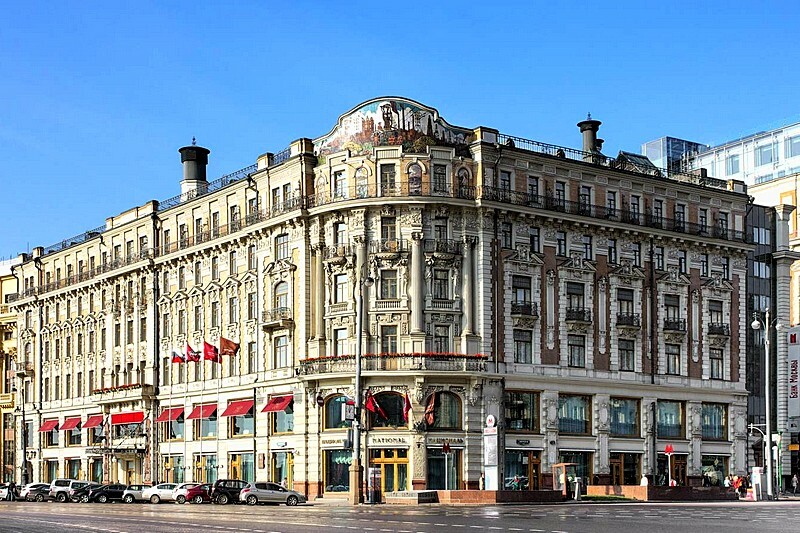 Today you can either continue your independent exploration or book a walking tour of Arbat and Moscow Metro. 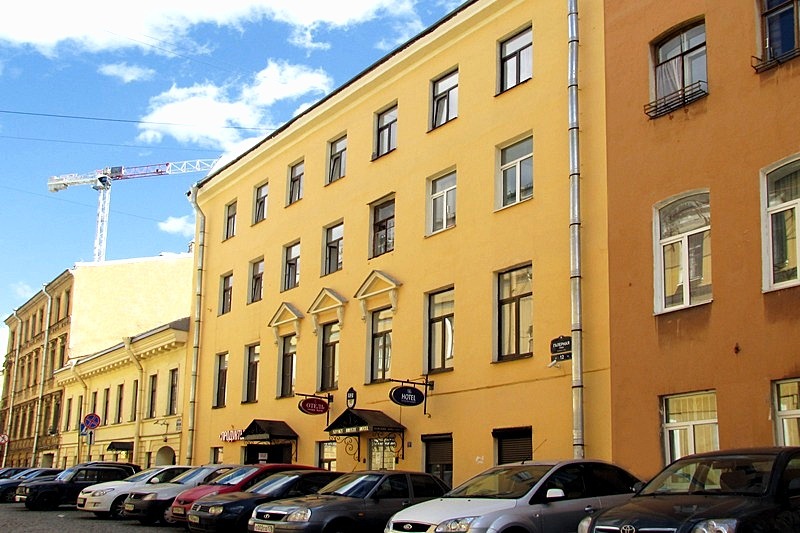 Arbat is the main walking street of Moscow popular with street artists, foodies and art lovers. A must see for any first time visitor! 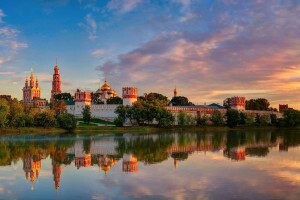 Alternatively, you can find out more about the mighty Moscow Kremlin by visiting its grounds. Make sure to see the Armoury where you can find the largest collection of Fabergé eggs in the world and 9 halls of unique treasures and thousands of exhibits. 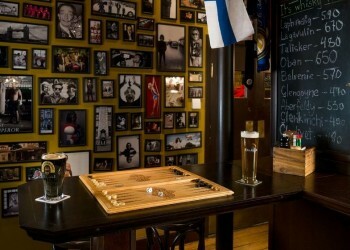 Want to try an unusual authentic experience? Why not book a banya session at Sanduny with us? 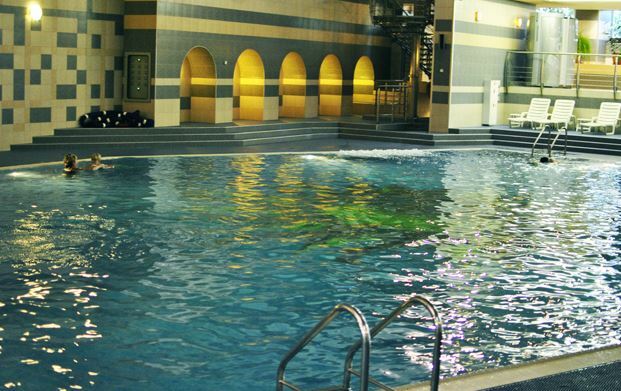 It is not only a Bath House but also a cultural and architectural landmark of the city. After breakfast at the hotel, check-out and be ready with your luggage. 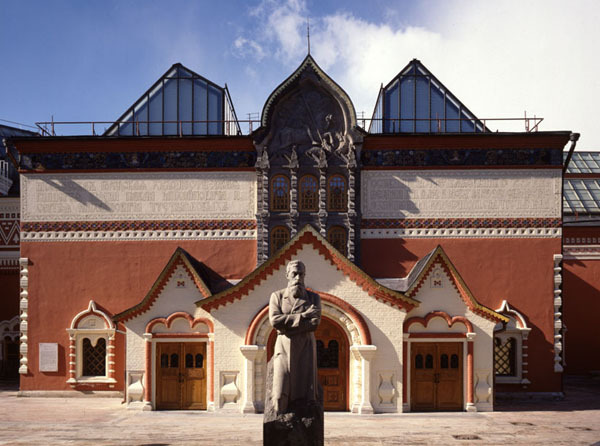 You still have some time before the train departure, so why not visit the world-famous Tretyakov Art Gallery - the magnificent collection of paintings of Russian and foreign artists. Alterntively, you can spend the morning in the Cold War museum - Bunker -42. Located 65 metres below ground level the bunker was designed as a shelter for Stalin and other senior Soviet officials in case Moscow was attacked by nuclear weapons. In the afternoon we will transfer you to the railway station, where you will appreciate the convenience of the Sapsan high-speed train to St Petersburg. 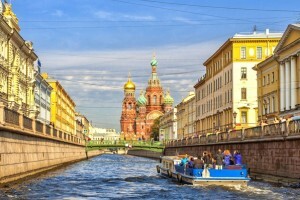 In less than 5 hours and you will find yourself in the cultural capital of Russia, St Petersburg. Transfer to the hotel. 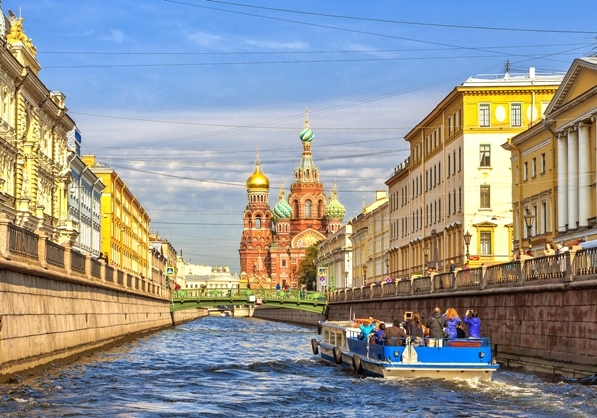 Get to know the Venice of the North on your optional city tour where you will explore the best of Russia’s former capital. Visit the Peter and Paul Fortress to uncover its intriguing history, climb St Isaac's Cathedral to appreciate the views of the city and marvel at the beautiful Church of the Savior on Spilled Blood. 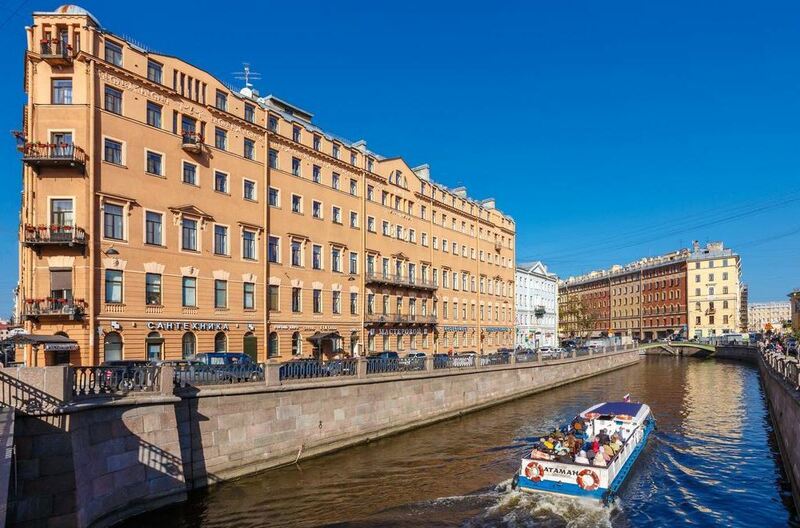 In the afternoon we recommend taking a boat tour along the canals of St Petersburg to enjoy the breeze and the best views the city has to offer. 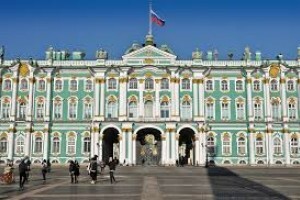 Today you can choose to visit the Treasury of the world culture - the Hermitage. Stand back and surround yourself with one of the world’s largest art collections and view masterpieces from all time greats including Da Vinci, Monet and Michelangelo. An experience not to be missed! Looking for an unusual experience? Then a rooftop tour would be perfect for you! Today you could make your way out of St Petersburg for a while and take an optional out of town excursion to the picturesque village of Pushkin to admire the golden domes and the Amber Room of Catherine’s Palace. Alternatively, travel to Peterhof by hydrofoil to enjoy the gorgeous fountains and gardens. Peterhof was built as a response to the Palace of Versailles by Louis XIV of France and is now a UNESCO World Heritage Site! 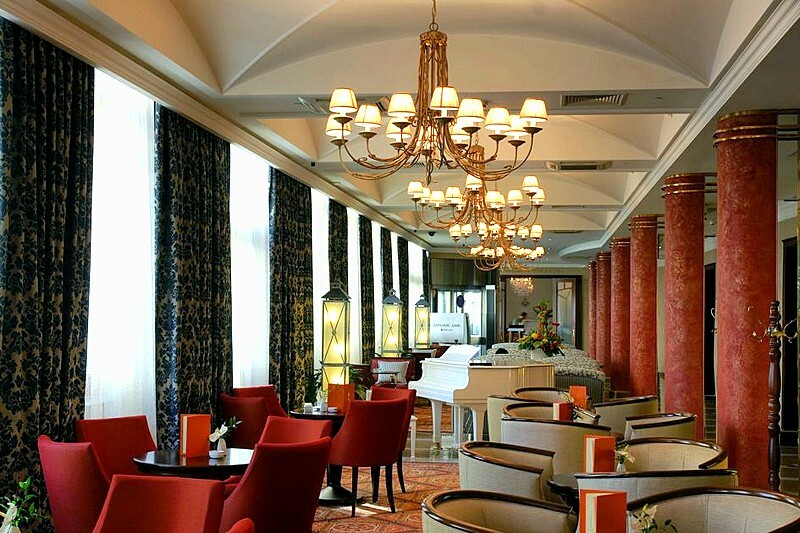 Enjoy breakfast at the hotel before transferring to the airport for your flight home as you wave goodbye to Russia, until next time! 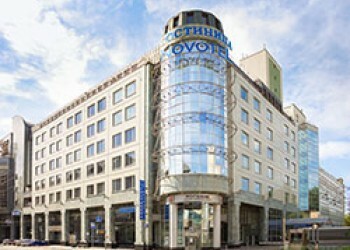 The Vega Hotel & Convention Center is located in the beautiful historical district of Moscow - Izmailovo. 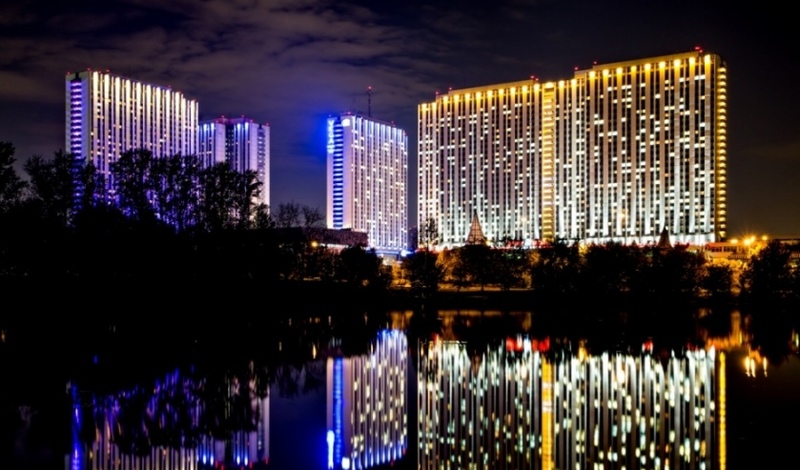 In the immediate vicinity of the hotel are historical monuments: Izmailovo Park with scenic ponds, the church, founded by Peter the Great, Izmailovo Kremlin and the Circus of singing fountains. 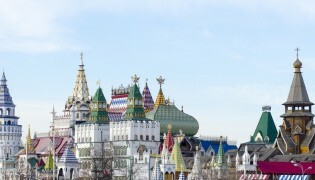 The park is the ideal place for strolling in summer, and the Izmailovsky Souvenir Market, which is held in a wooden fenced enclosure near the metro station every Saturday and Sunday, is on of the best places in Moscow to pick up reasonably priced gifts, including nesting dolls and hand-painted wooden bowls and spoons. 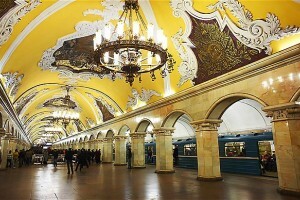 It will take you only 15 minutes by subway to reach the historical heart of Moscow – Red Square. 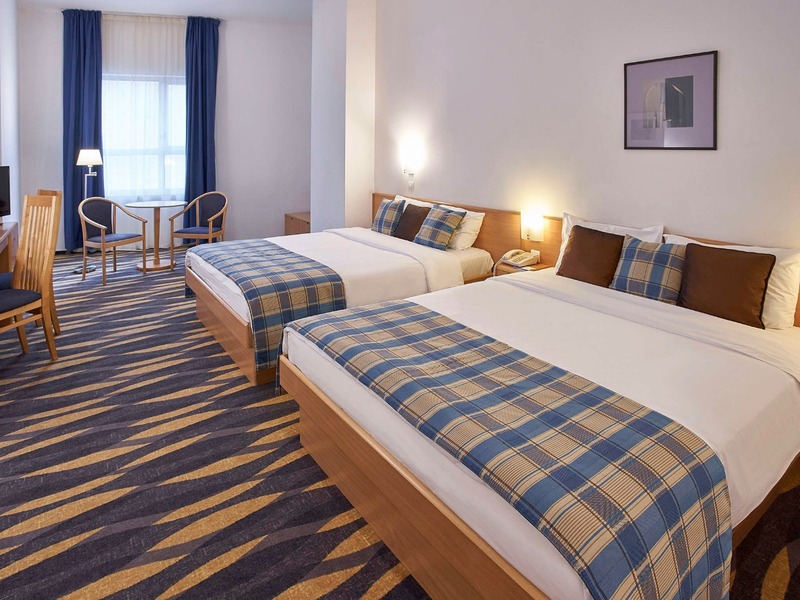 The 967 rooms at the Best Western Vega Hotel cover 24 floors, and range from quite basic Standard Rooms to spacious, modern apartments. 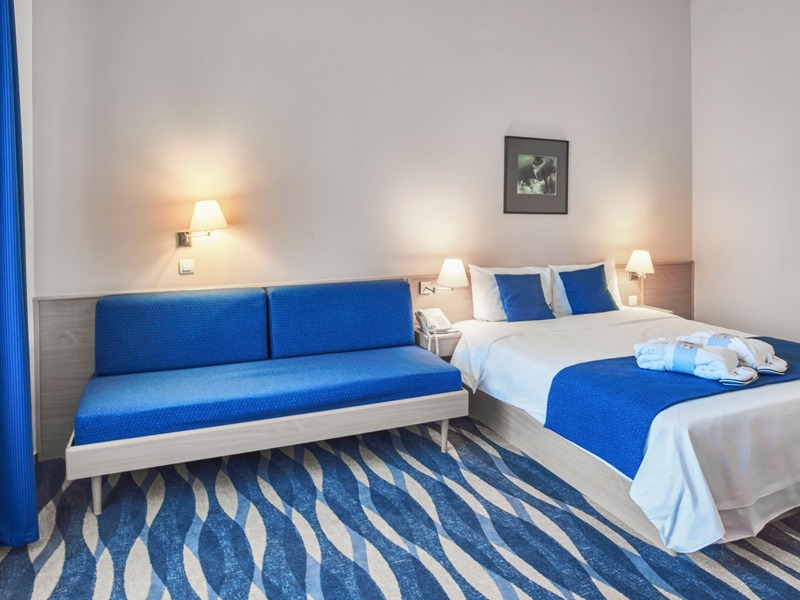 All guest rooms are similarly sized and have been recently renovated, with air-conditioning and complimentary WiFi access throughout, while the class of rooms is determined by the level of extra amenities. 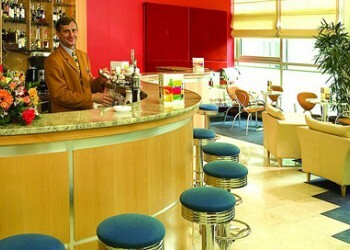 The Hotel offers three classes of suite, providing relatively low-cost accommodation for long-stay guests and families. 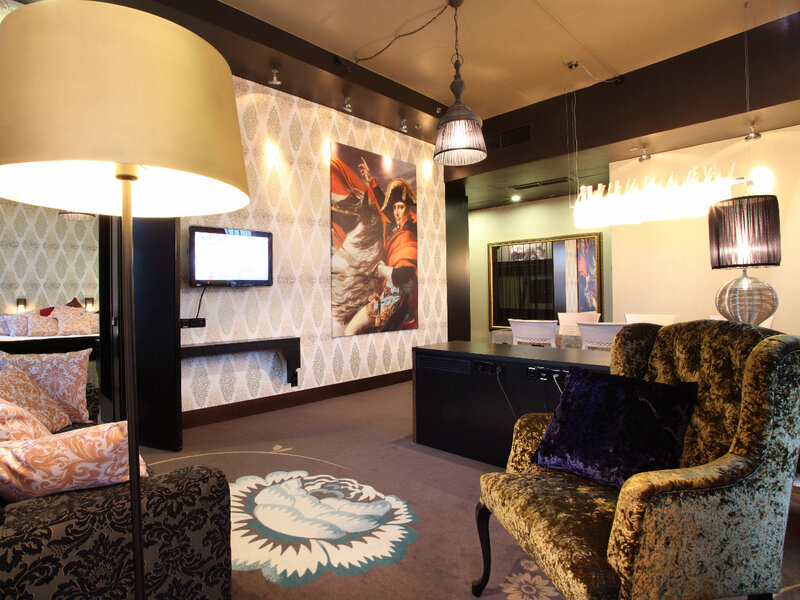 Junior Suites and QUEEN Suites are fairly simply decorated and fitted, while the Best Western's apartments are actually quite luxurious. 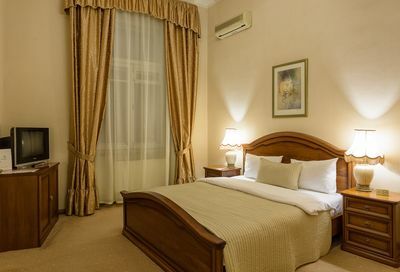 The rooms at Vega Izmailovo Hotel & Convention Center feature air conditioning, a flat-screen TV with satellite channels. Bathroom comes with a hairdryer, bathrobes, slippers and free toiletries. 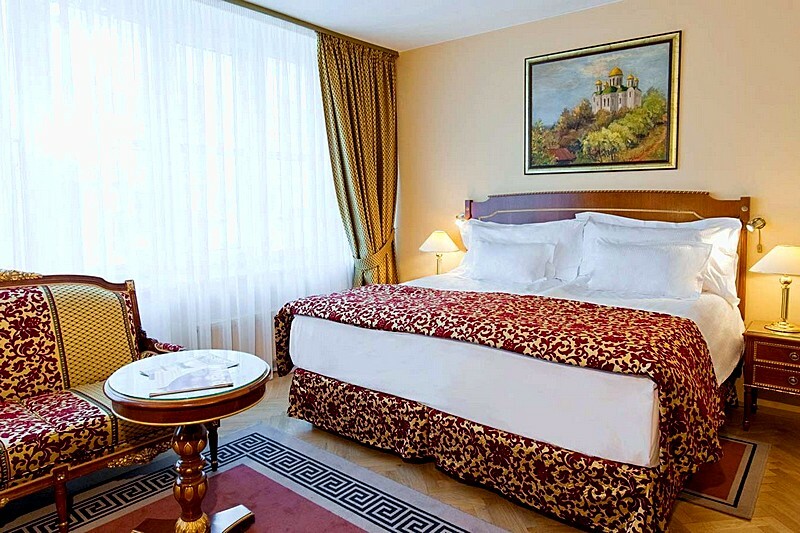 Each room offers scenic views of the the Izmailovo Kremlin or the Izmailovsky Park. 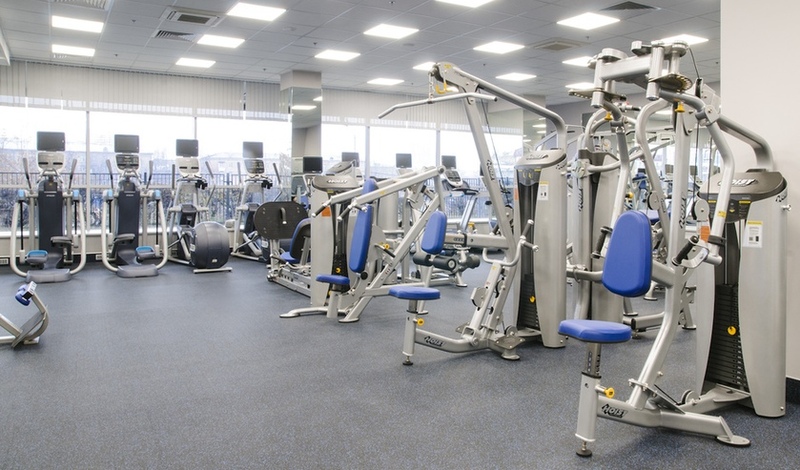 Vega Hotel does not have it's own fitness centre, but instead offers guests complimentary access to the professional fitness club in the nearby building of the Izmailvo Gama-Delta Hotel. On-site, the Best Western offers a range of Spa facilities; Sauna, Plunge pool, Jacuzzi, Russian baths, Turkish hamam, Fitness center nearby. 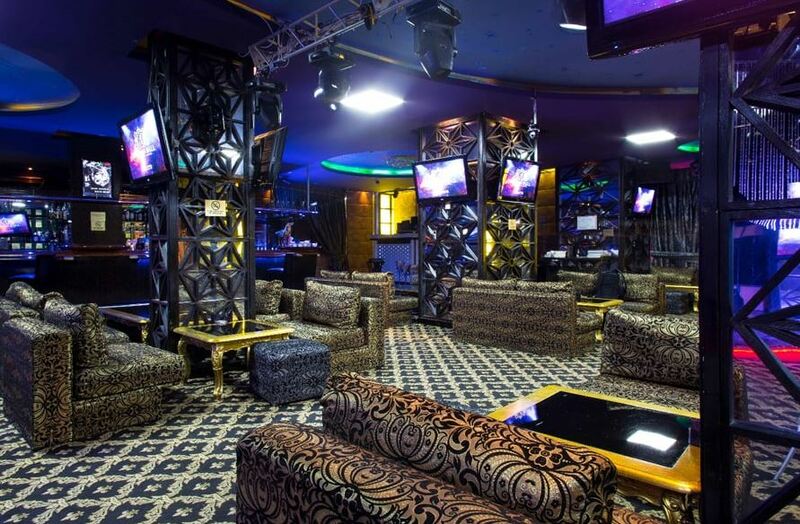 Having recently repositioned itself as a superior business and conferencing hotel, the Best Western Vega works hard to provide business travelers with all essential support services. Services are offered both through the 3rd floor Business Centre (open from 9am to 9pm daily) and at the concierge desk in the lobby; Photocopying, PCs with Internet, Printing, Fax, Rental of mobile telephones, Laminating. The Best Western Vega Hotel has a wide range of standard services available from the multilingual staff at reception; 24-hour reception desk, Room service, Porter service, Left-luggage office, Safe deposit boxes, Dry cleaning and laundry services, Free parking, Medical services, Currency exchange, ATM, Clothes repair service, Wake-up service, Souvenir/Gift shop. 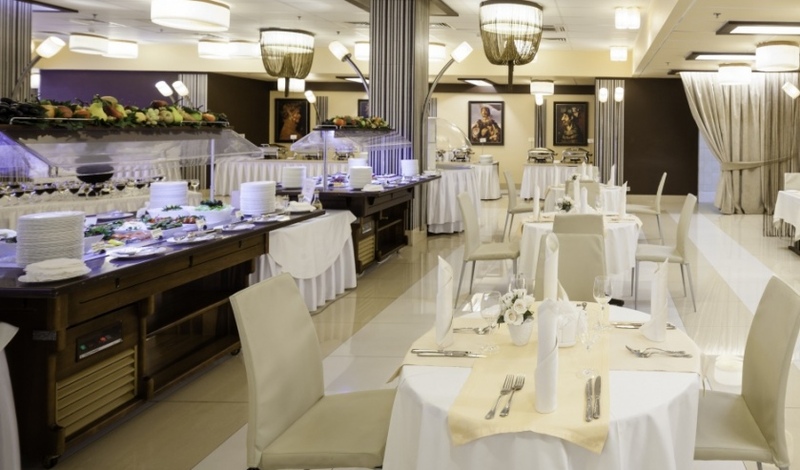 The Best Western Vega Hotel has a number of on-site eating options, serving Russian and European cuisine. 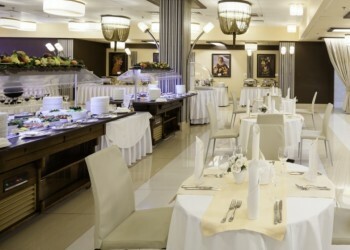 Guests can also order a range of items from room service, and explore the restaurants of the other hotels that make up the Izmailovo complex. 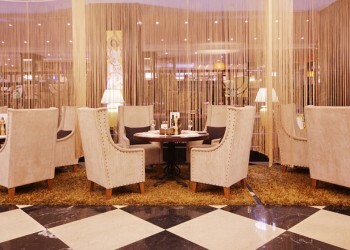 Buffet breakfast is served in the Vega Restaurant daily from 7am. 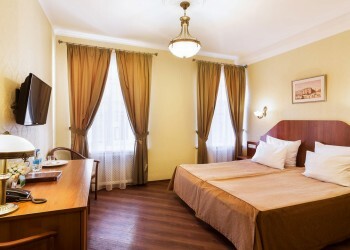 The Budapest Hotel is excellently located in the very heart of Moscow, just steps away from the Bolshoi and Maly Theaters, Red Square, the Kremlin museums. 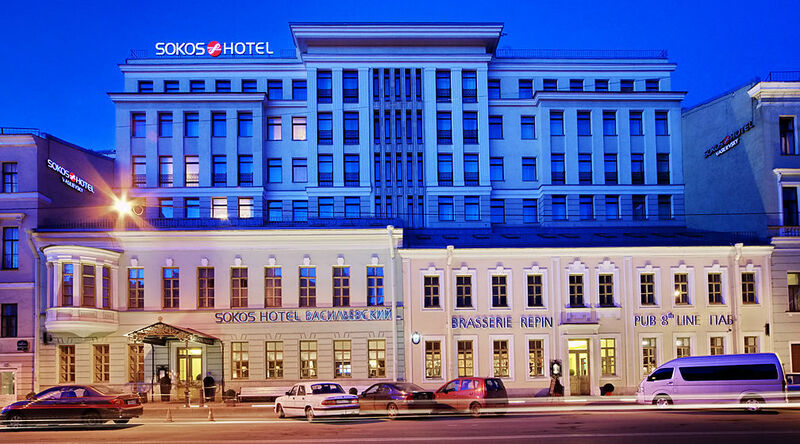 The hotel was built in 1876 by the architect Freidenberg and now it is a cultural value of Moscow city. 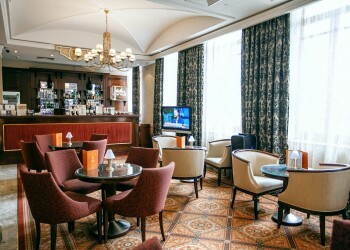 The Budapest Hotel has more than hundred years of hospitality history and since opening has became extremely popular among businessmen and tourists for its unique location, reasonable prices, comfortable rooms and high level of service. The nearest metro stations: Kuznetsky Most, Okhotny Ryad, Trubnaya, Tsvetnoy Bul’var, Lubyanka, Teatralnaya, Ploschad Revolutsii. 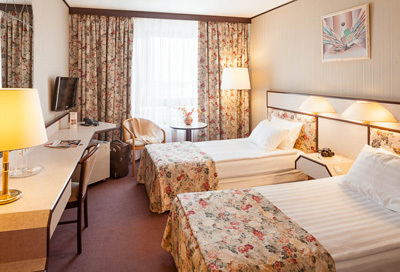 116 guest rooms: 51 Single, 20 Double, 12 Junior suite B, 25 Junior suite A, 8 Deluxe. 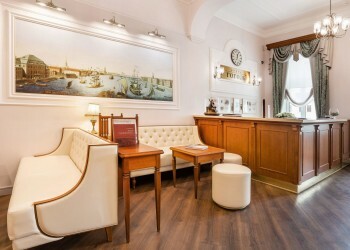 The Budapest Hotel offers its guests the unique opportunities for accommodation – each room is individually designed and decorated in keeping with historical architecture of Moscow. The room’s interior designed in retro style with modern facilities. Satellite TV, air-conditioner, mini bar, telephone, safe box, hairdryer, Wi-Fi. 24 Hour room service; Lobby bar; Concierge and travel services; Airport – Hotel – Airport transfers; Meeting and event facilities ( capacity of conference halls and meeting rooms range from 5 to 60 people); Business center; Free Wi-Fi; Access to fitness center of Peter I hotel (pool, gym, Turkish hammam). Free access in weekends and extra charge in weekdays; Laundry and dry cleaning. 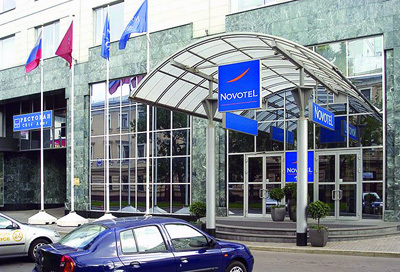 Hotel "Novotel Moscow Centre Hotel"
Fitness Center, massage, Room service, safe deposit boxes at Reception Desk, concierge services, currency exchange, laundry & dry cleaning, ironing, theatre tickets, guarded parking lot, 24-hour security staff, public outdoor parking, pet friendly. 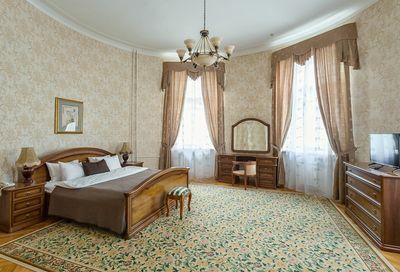 The Peter I Hotel is located on historic Neglinnaya Ulitsa, within comfortable walking distance of the Kremlin, Red Square and, particularly, the Bolshoy Theater, just a few minutes' down the road from the Peter I Hotel. This glorious neoclassical edifice houses one of the most celebrated musical theatres in the world, renowned for the muscular dancing style of its ballet troupe. 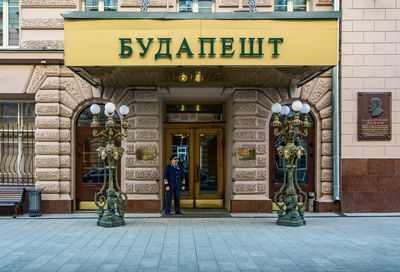 Other sights of interest in the immediate vicinity of the Peter I Hotel include the Bank of Russia, an imposing and ornately decorated late 19th-century building located almost directly opposite the hotel on Neglinnaya Ulitsa. Behind the hotel in a courtyard accessed from Ulitsa Petrovka, the Museum of the GULAG is a small but extremely active museum that commemorates the victims of Soviet oppression via a wide variety of documentary and artistic projects. 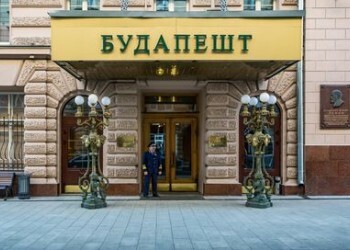 In sharp contrast, the Sandunov Baths, also a few steps from the hotel on Sandunovskiy Pereulok, are the most famous public baths in Moscow, and offer guests a uniquely Russian experience as well as a taste of 19th century luxury. 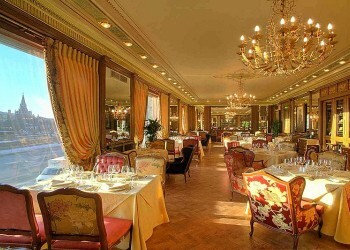 There are 112 Standard Rooms at the Peter I Hotel. 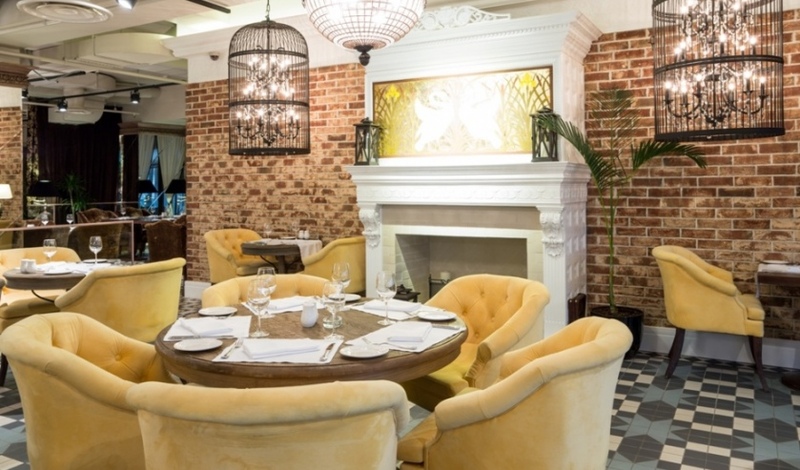 In contrast to the strict neoclassicism of the building's facade, the interiors at the Peter I have been designed in a modern, minimalist style. Simple, sober colors dominate, but are offset by the vibrant fabrics used for curtains and soft furnishings. 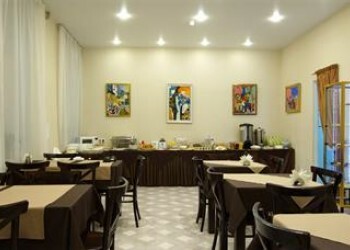 The hotel has non-smoking rooms, and three rooms specially equipped for disabled travelers. 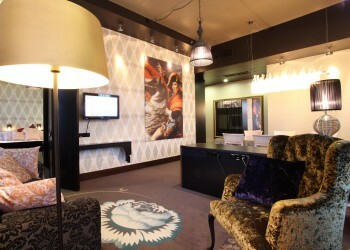 All rooms at the Peter I have Wi-Fi coverage, as well as a host of other guest amenities. 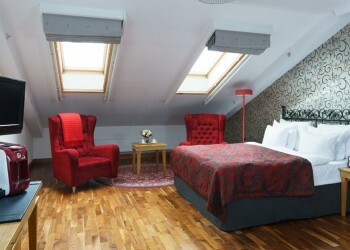 The 15 rooms on the Peter I's VIP Floor feature extra comforts and attractive views over the center of Moscow. 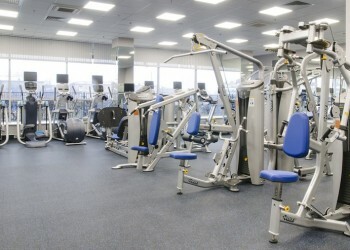 All room rates include breakfast and access to the Peter I fitness center. 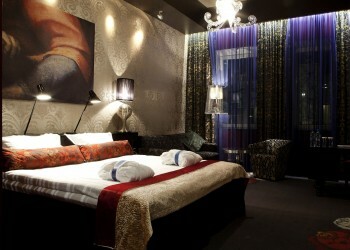 The Peter I Hotel has six two-room suites, all located on the hotel's VIP Floor, the top floor of the hotel. 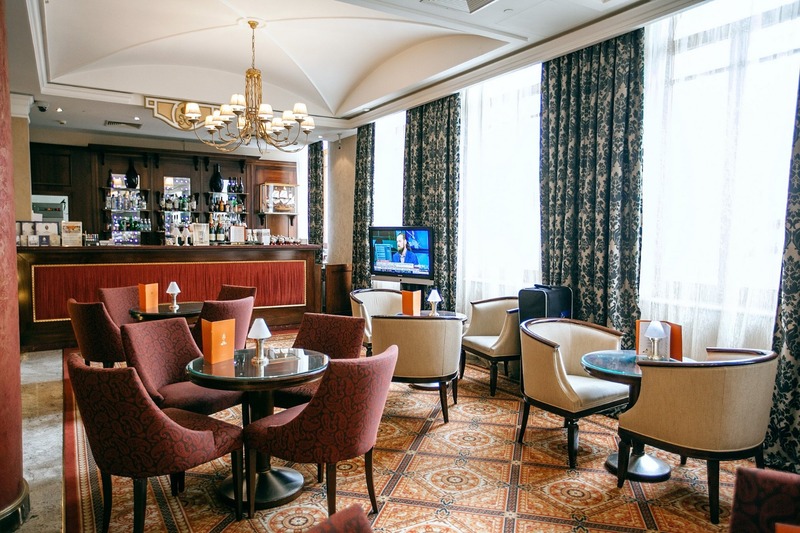 As well as impressive views of downtown Moscow, guests booking the Peter I's suites can enjoy exclusive access to the Executive Lounge, with all-day refreshments included in room rates. 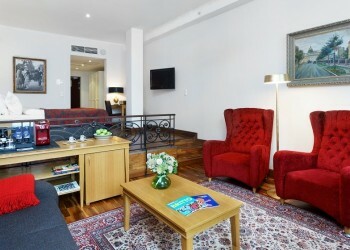 The Peter I Hotel has two three-room apartments, all located on the hotel's VIP Floor, the top floor of the hotel. 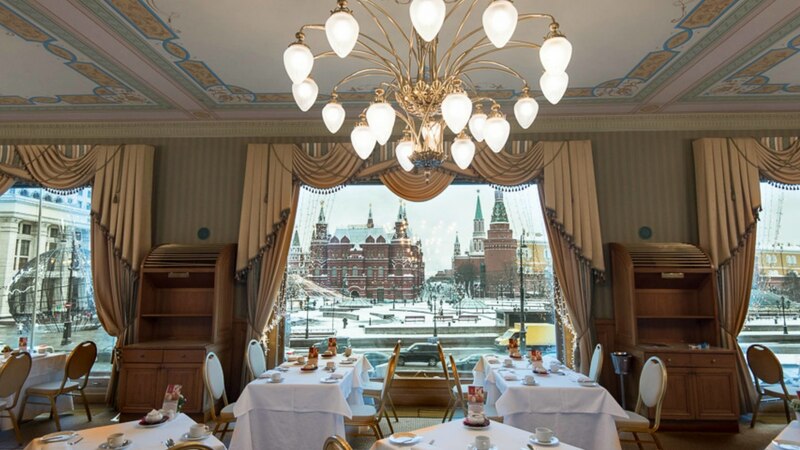 As well as impressive views of downtown Moscow, guests booking the Peter I's suites can enjoy exclusive access to the Executive Lounge, with all-day refreshments included in room rates. 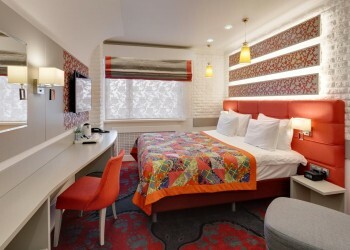 Although not large, the Peter 1st Hotel has a full range of deluxe guest amenities including a fitness center and beauty salon on site; Fitness Centre, Indoor pool, Hot tub, Turkish steam bath, Massage, Solarium, Beauty Studio. 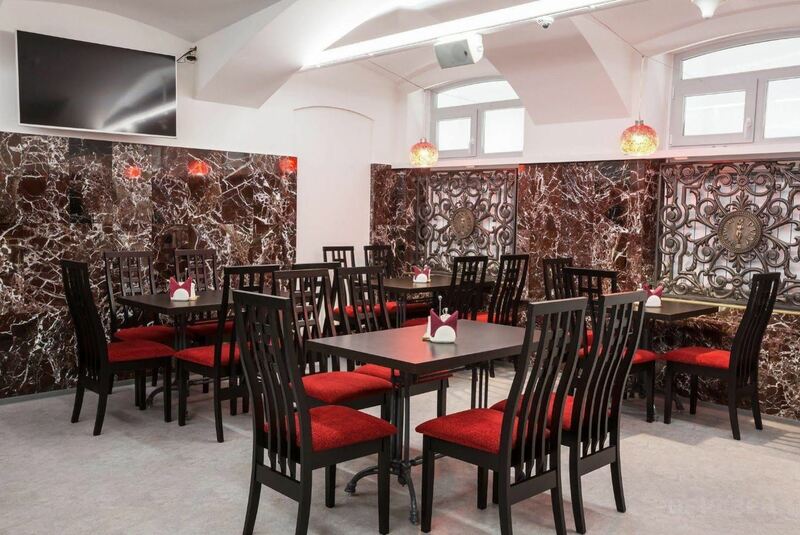 The Peter I Hotel is well equipped to welcome business travellers, with a range of support services available from the hotel's business centre; Free Wi-Fi Internet in public areas, Business centre, Fax/photocopying. 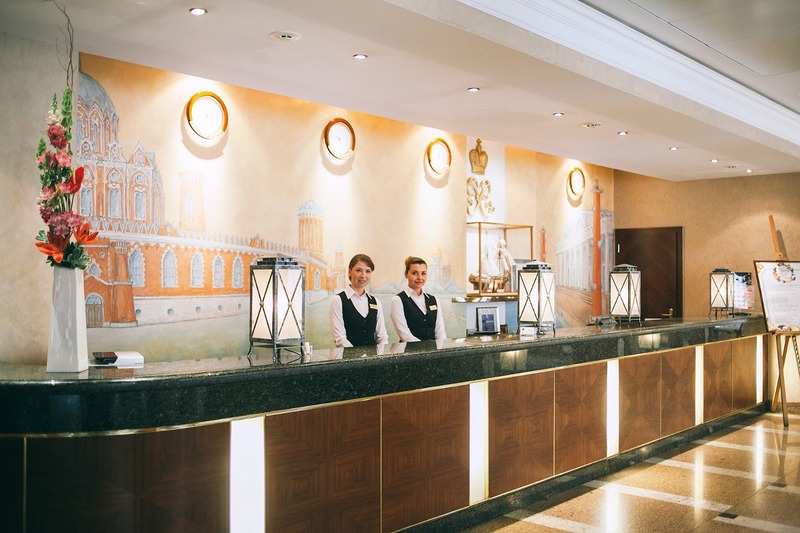 Guests at the Peter I Hotel will find a full range of superior services available from the English-speaking staff at reception: 24-hour reception, Express check-in/check-out, Room service, Dry-cleaning, Ironing, Guarded parking, First-aid and medical assistance, ATM. 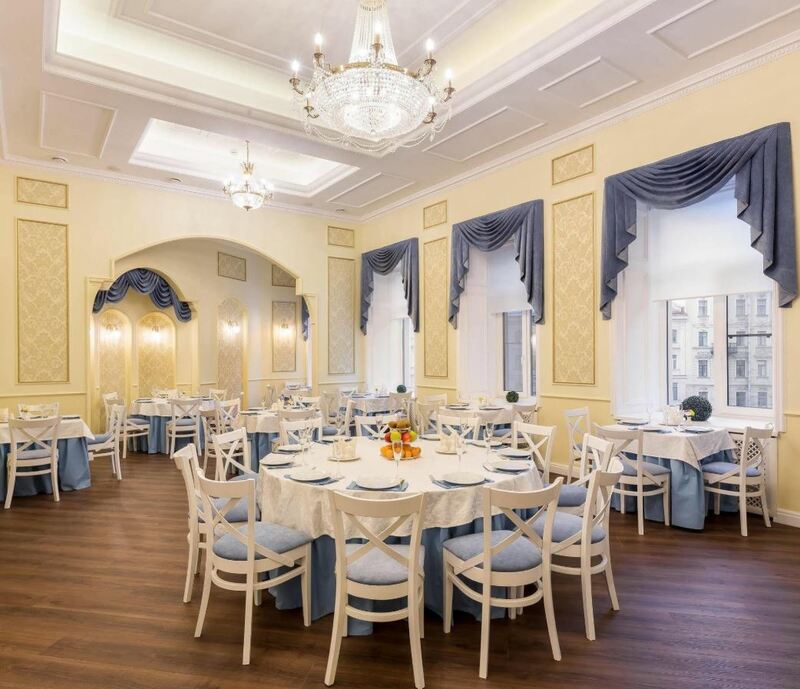 Located in the heart of Moscow, Hotel National is surrounded by iconic historical sights, including Red Square, the Kremlin, St. Basil’s Cathedral, the Pushkin Museum of Fine Arts, Bolshoi Theater, and the Cathedral of Christ the Savior. Major shopping centres, such as TSUM and GUM are also nearby. 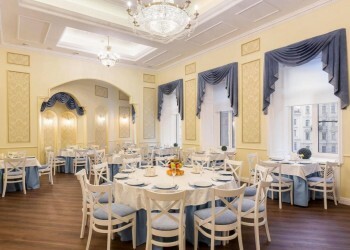 The Hotel offers 80 classic rooms: custom-appointed with classic Italian furnishings, our 17 to 20-square-metre Classic Single Rooms and 22 to 35-square-metre Classic Double Rooms invite guests to relax and rejuvenate in serene surroundings overlooking either the hotel’s inner courtyard or Tverskaya Street. In the centre of the room, a signature king-size or twin-size Luxury Collection bed is wrapped in supple sheets and topped with plush pillows, downy duvets, and rich scarlet and gold textiles—which all correspond to the room’s timeless palette. 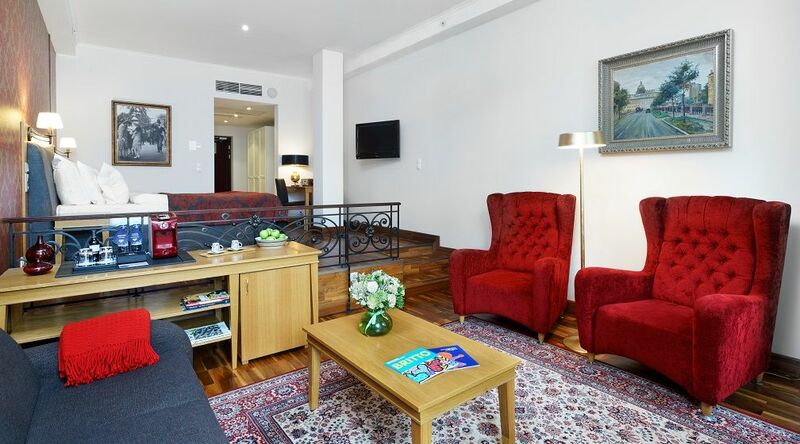 67 Spacious and elegant, 30 to 40-square-metre Studio Rooms welcome guests with an authentic cloakroom. 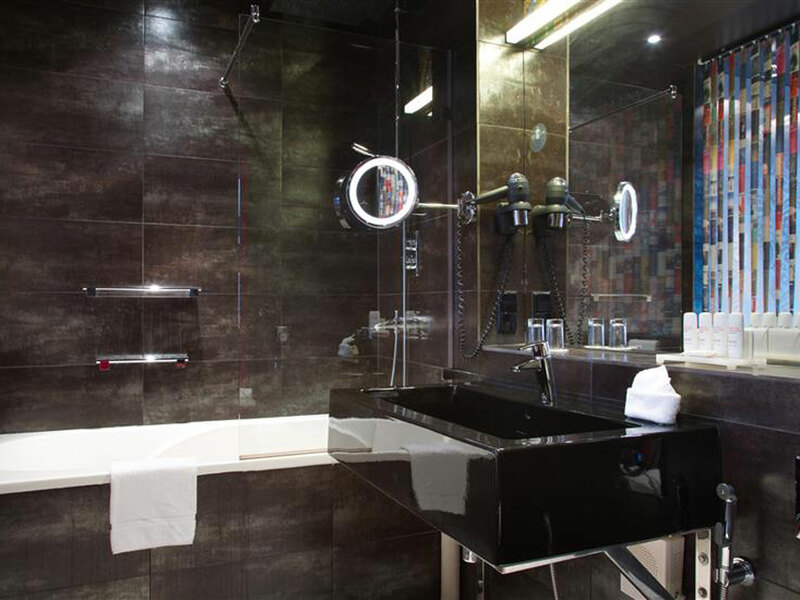 Both room types offer spacious bathrooms with heated floors, some equipped with whirlpools and others with a bathtub with shower. 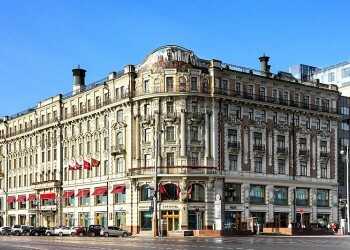 The National Hotel has 56 historical suites, each of which is adorned with authentic and rare Russian antiques, including vases, lamps, mirrors, statues and paintings. 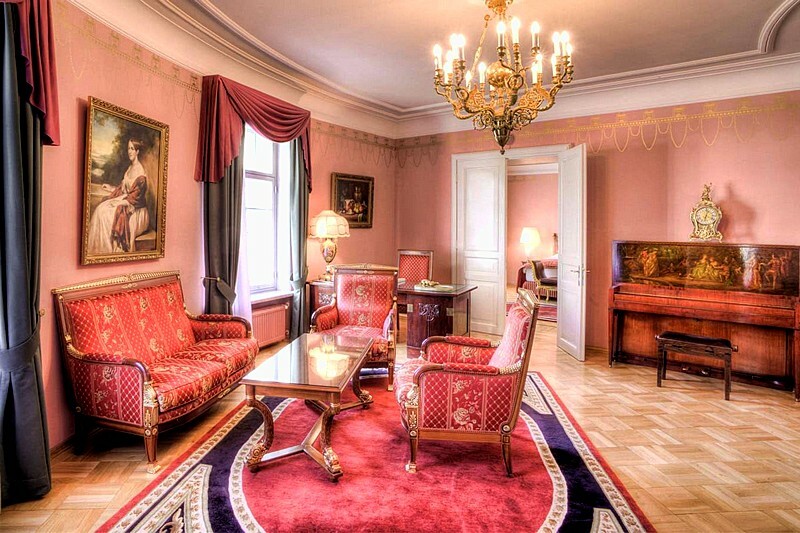 Most suites also boast superb views over the Kremlin or historic Tverskaya Ulitsa. 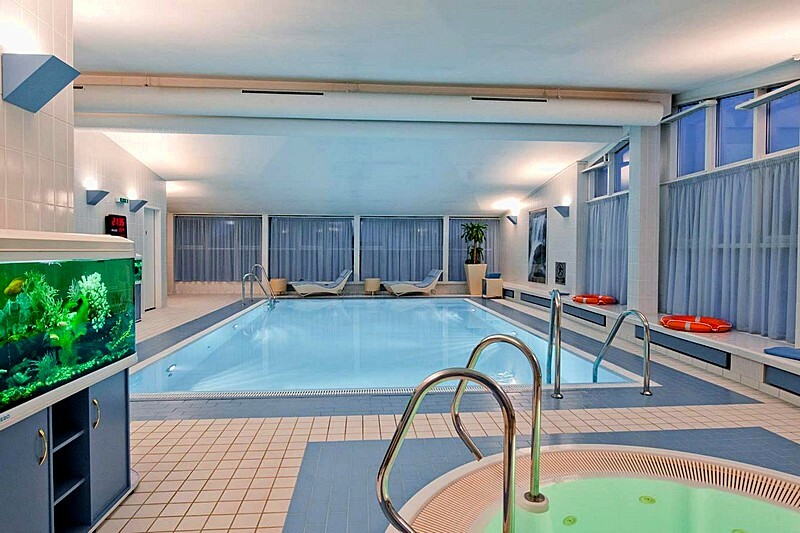 Guests of the National Hotel are offered exclusive use of the hotel’s fitness center with modern gym and indoor pool, as well as the luxurious Orchidee Beauty Studio; Sauna, Steambath, Fitness Centre, Indoor pool, Massage, Solarium. 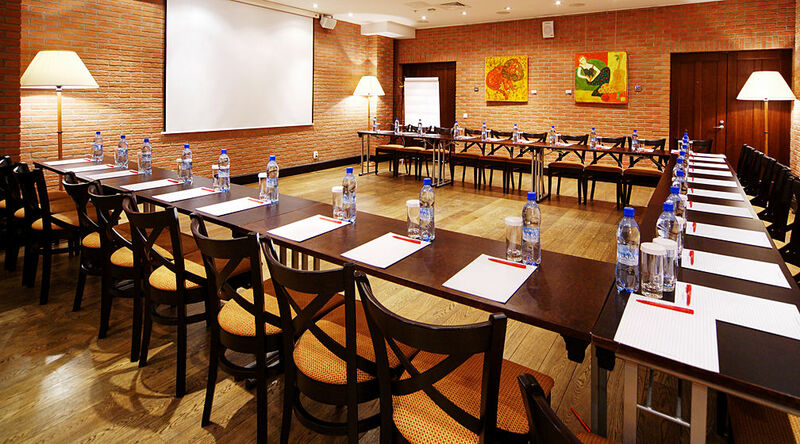 The National Hotel offers a number of state-of-the-art meeting and conference rooms as well as access to the onsite business center, offering complimentary printing and free WiFi internet access. 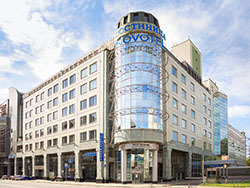 The five-star National Hotel has a 24-hour reception desk which ensures all guests a comfortable and luxurious stay in downtown Moscow: 100% Non-Smoking Rooms and Facilities, 24-Hour Security, Entry Visa Assistance, Luggage Storage, Bellmen/Porters, Concierge, Doorman, Safe Deposit Boxes, Laundry Service, Multilingual Staff, Shoe Shine Service Available. 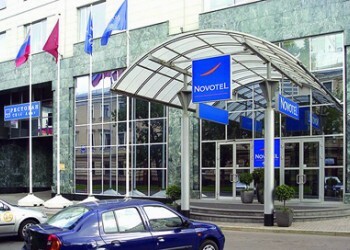 Nevsky Breeze Hotel was opened in 2008. 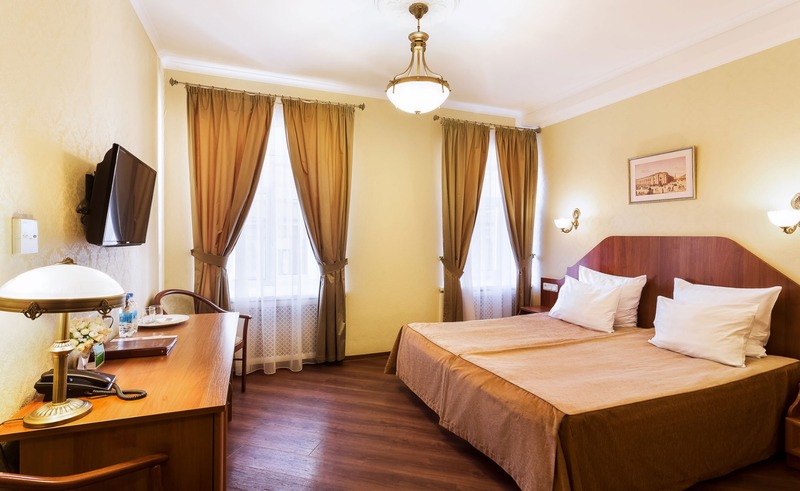 This cozy hotel with spacious rooms for business travelers and for family accommodation is situated on Galernaya street, just 3 minutes away from St. Isaak’s Cathedral, the Neva River embankment and the famous Bronze Horseman monument and only a short walk away from the Hermitage. Meanwhile, the whole area around the hotel is packed with monumental neoclassical architecture and sights of historical significance. 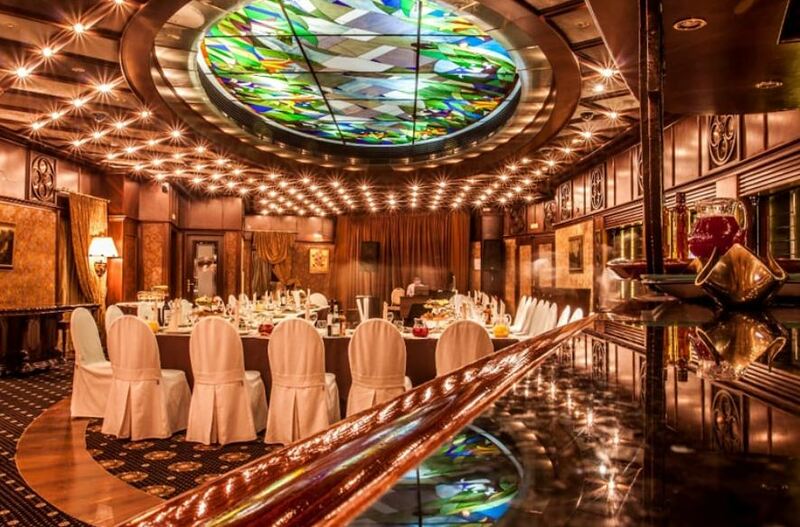 The hotel is also situated 5 minutes away from the Wedding Palace on Angliyskaya embankment, it has perfect location for arranging bridal preparation or for the accommodation of the wedding guests. 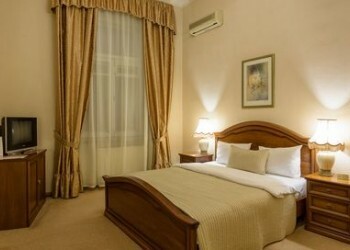 There are 32 rooms in Nevsky Breeze Hotel: 29 Standard rooms and 3 Superior rooms with Jacuzzi-bath. All rooms are equipped with flat-screen TV, telephone, room safe, air-conditioning and private facilities with hairdryer and free toiletries. 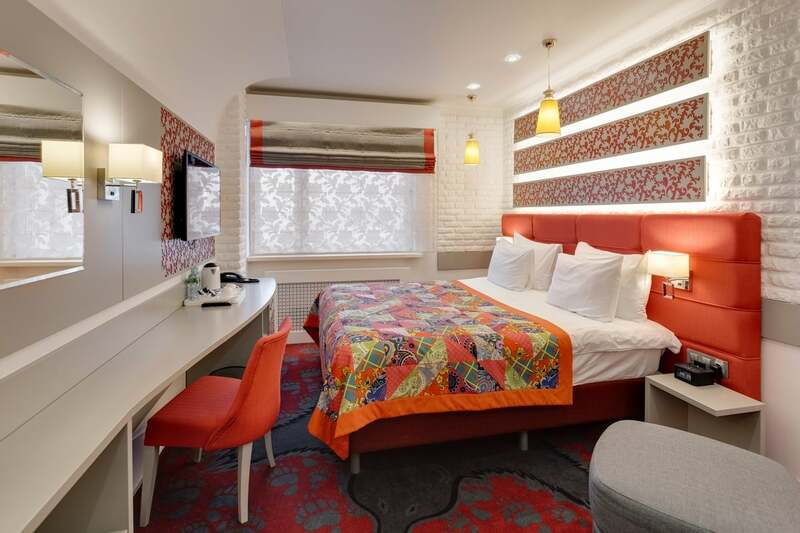 Spacious rooms with modern design come with double bed or twin beds, flat-screen TV (in rooms featuring sleeping and living areas there is one in each area), wardrobe, couch or armchair, desk, chair, phone, safe, individual A/C, bathroom with shower, toilet and hairdryer. 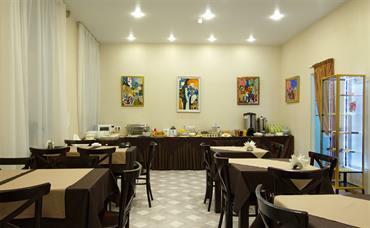 Сontinental breakfast is included in room rate. Reception desk, 24-hour security service, Car hire with drive, Booking of air and rail tickets,Booking of excursions, Interpreting, Laundry and dry-cleaning, WiFi access. 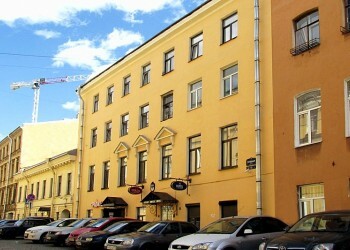 Gogol Hotel is placed in the center of Saint Petersburg steps away from exhibition centers and banks. 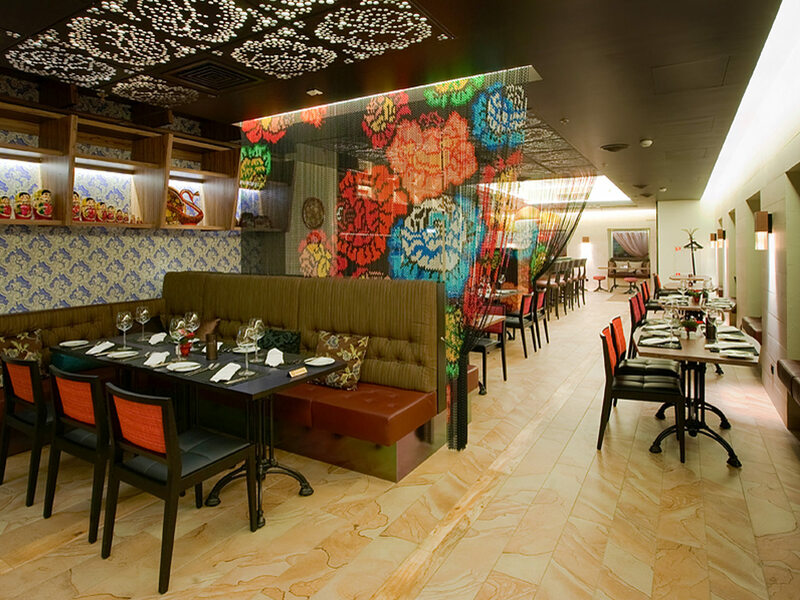 Featuring traditional architecture, the hotel is welcoming guests since 2012. 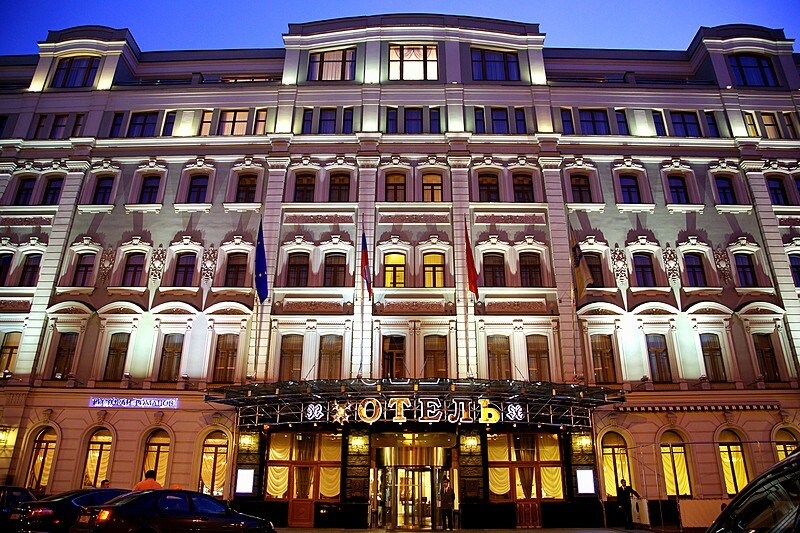 The elegant hotel is set next to Ploschadka Skorohod, Winter Palace of Peter I and State Hermitage Museum and Winter Palace. 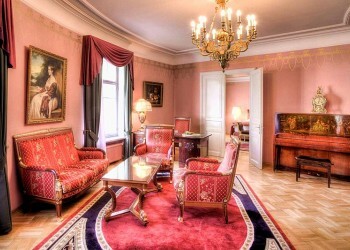 The venue is 2 km away from the city center.Monuments, the palace and the cathedral are set within walking distance. 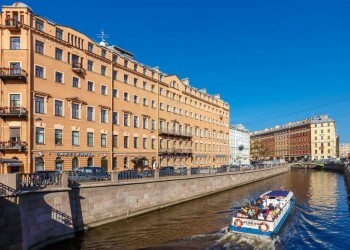 Local attractions: Nicholas Naval Cathedral of The Epiphany 950 m, Saint Isaac's Cathedral 1000 m, Na Fontanke, Saint Petersburg Youth Theater 700 m, Hermitage 1.6 km, Petrovsky Stadium 3.2 km, Bank Bridge 950 m, The Admiralty 1.3 km. 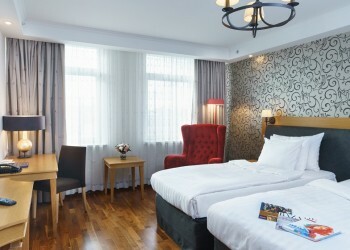 The hotel offers over 30 rooms. 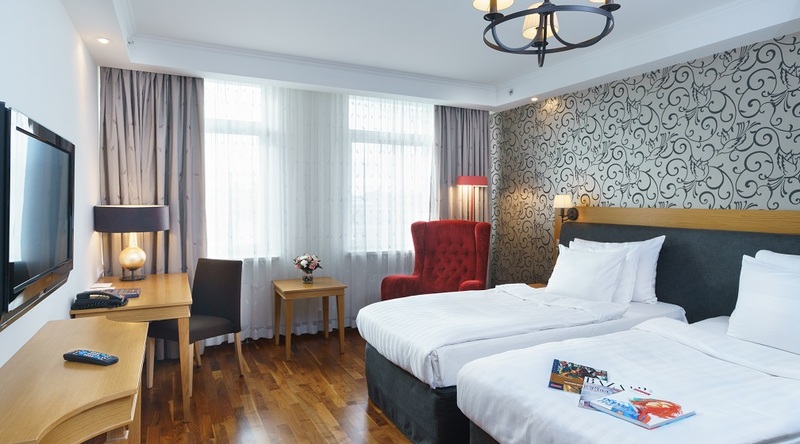 Some of the luxury hotel rooms feature individual climate control, direct dial phone, wireless internet, an in-room safe and a seating area as well as an electric kettle, coffee/tea makers and a fridge. 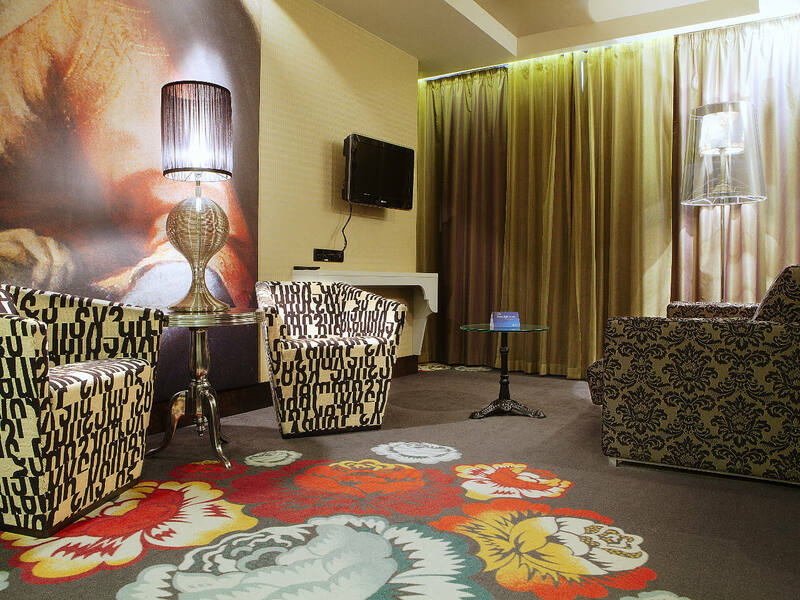 The rooms come with smart décor along with modern light wood furniture. 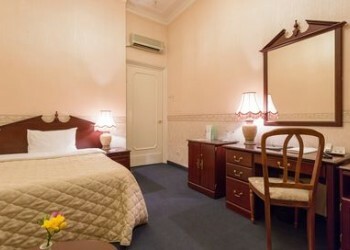 The hotel offers various room categories: standard single, twin or double, junior suite, suite with jacuzzi. Rooms are equipped with air conditioning, a flat-screen TV, telephone, refrigerator, safe, bathroom with shower (or bathtub), Hairdryer, toiletries, bathrobes and Slippers. 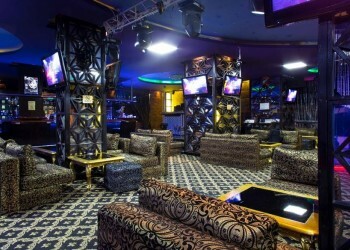 The hotel futures a Night Club. 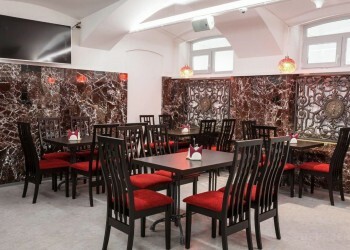 Gogol Hotel offers a business centre with access to Fax/Photocopying and Meeting/ Banquet facilities. 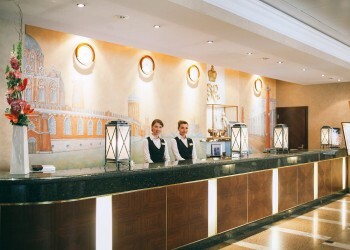 Among the services offered by Gogol Hotel: room service, Car rental, Dry cleaning, Housekeeping, Laundry, Airport shuttle, Shoe shine service, Paid airport shuttle, Tours/Ticket assistance. 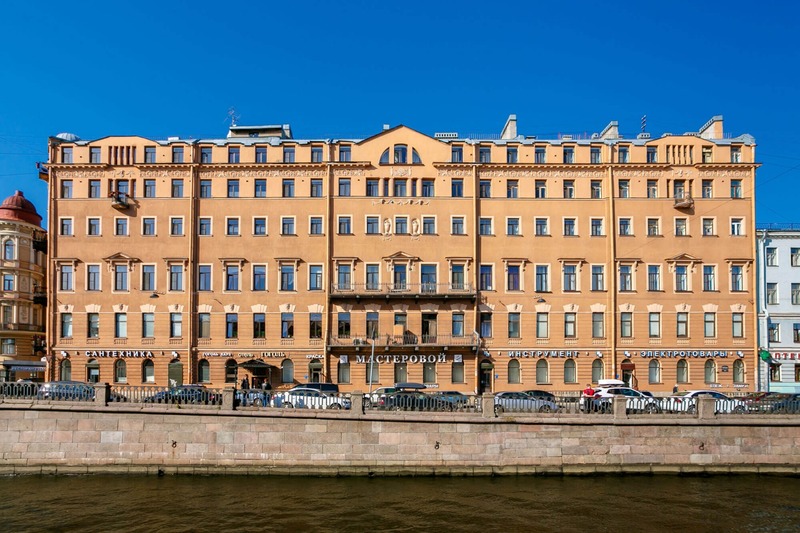 Solo Sokos Hotel Vasilievsky can be named as the first gallery hotel in St. Petersburg, which is situated on the Vasilievsky Island, close to the Neva river embankment and Blagoveshchensky bridge. 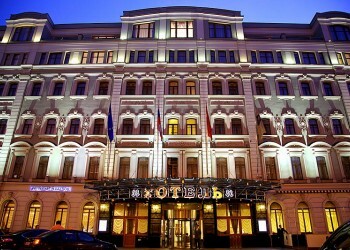 You will reach the Hermitage and Nevsky Prospect in 5 minutes by bus. 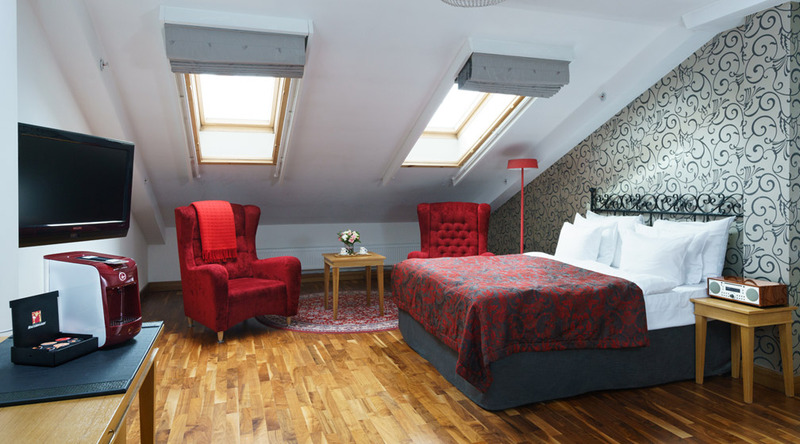 Each room in the hotel has been individually designed to add character and a sense of distinction to the hotel. 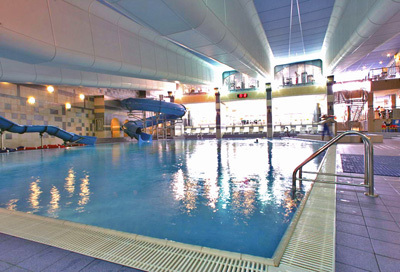 A fitness centre and a sauna are available. 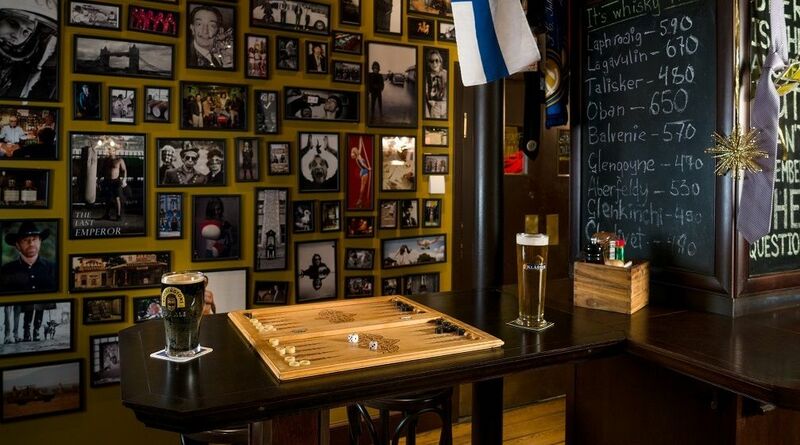 Repin Restaurant serves dishes of Northern cuisine, while the 8th line pub screens sports games in Full HD and offers draft beer and a variety of whisky. 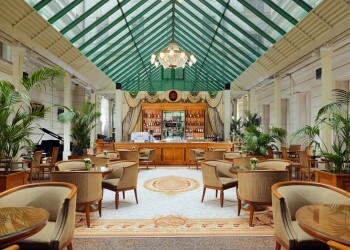 The hotel hosts art exhibitions on a constant basis. 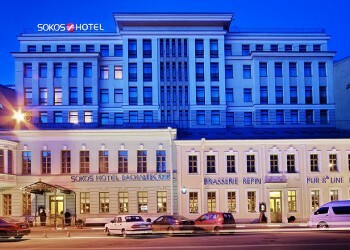 The only hotel designed to reflect Feodor Dostoevsky's masterpiece “Crime and Punishment”. All the interiors are connected to the book and the author, even signs on the doors have quotes on them so that while walking along any corridor one can read a piece from the book. 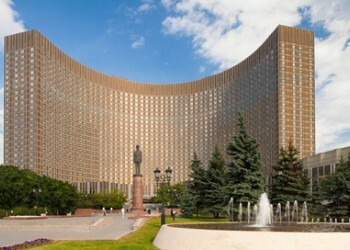 The hotel is named after Sonya Marmeladova (one of the book's characters). “Radisson Sonya” offers 173 rooms of four categories that have special names that correspond the hotel philosophy: Standard — “Conscience”, Reval — “Gгасе”, Executive — “Rebirth” и Suite — “Еgо”. All rooms have: Wi-Fi Internet, individual climate-control, telephone, safe, tea/coffee set, mini-bar, desk, make-up mirror, satellite TV. 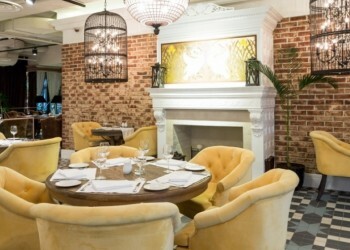 The Metamorfos restaurant The restaurant is gorgeously decorated in the common conception of the hotel. 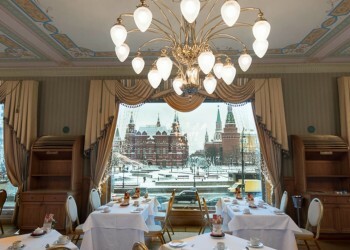 The menu (that looks like a book) includes a great variety of dishes from Russian (incl. 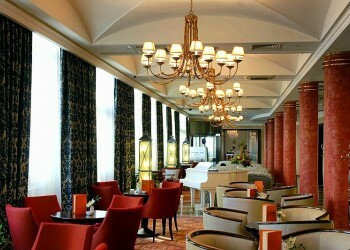 traditional and historical recipes) and European cuisines. 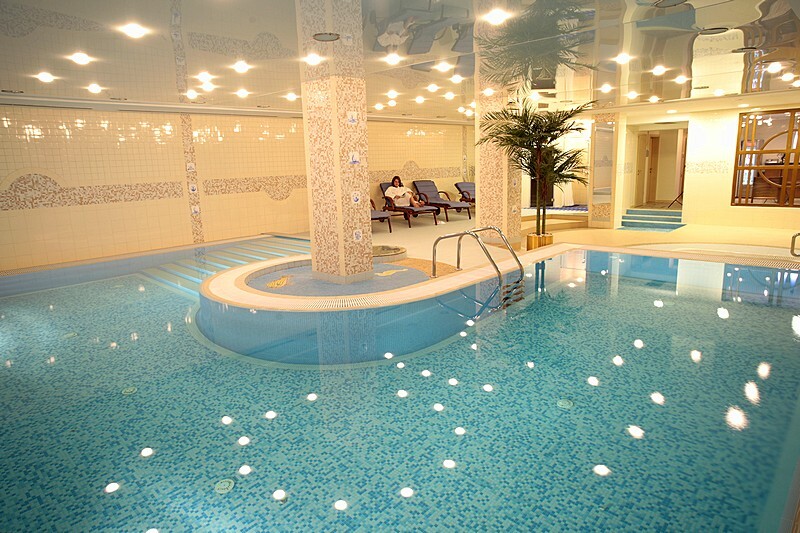 There is also a Fitness Center and Turkish baths on the territory. 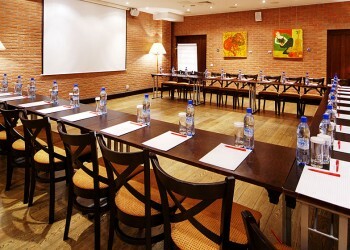 Radisson Hotel Sonya has all the necessary facilities for hosting seminars, meetings and conferences. 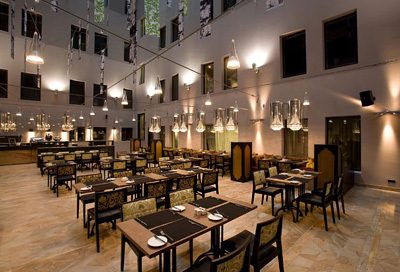 There are four conference halls that can sit from 8 to 65 people and a court-yard for official dinners and banquets. All halls are fully equipped. 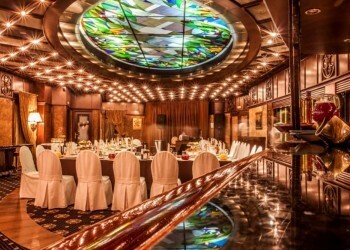 Hall Prologue — Meeting room (11,6 sq.m.). Sits up to 8 people. 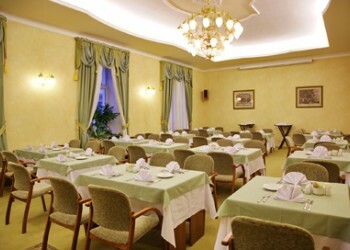 Hall Chapter I — conference hall (20,9 sq.m.). Sits from 10 to 15 people. 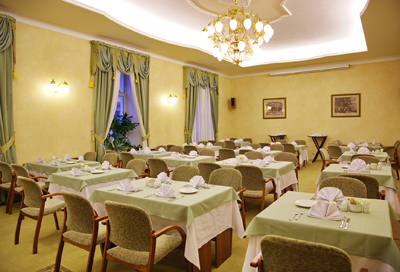 Hall Chapter II — conference hall (25,8 sq.m.). Sits from 15 to 20 people. 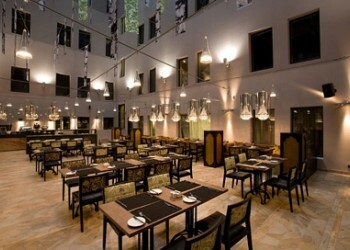 Charpte I and Chapter II Can be transformed into one hall (46,8 sq.m.) to sit up to 40 delegates. Epilogue — conference hall (83,6 sq.m.). Sits up to 60 delegates. 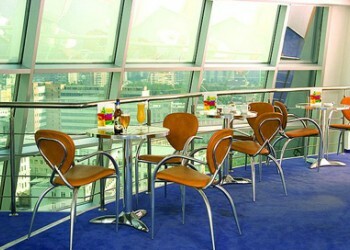 24/7 room service, Early breakfast from 4.30 a.m., ATM, Taxi service, Wake-up calls, Dry cleaning. Please note that ths is a tailor made tour; we reserve the right to change hotels to similar hotels of the same standard. Into Russia helped us create a smooth five-day programme that included experiencing the best of Moscow with the support of personal couriers, and meeting those different individuals and hearing their views was an important part of the visit. Thanks to everyone. 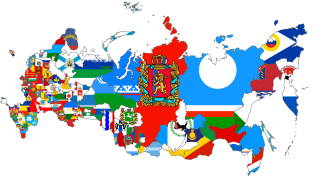 Just to say a very big thank you to IntoRussia for making Mr/s First’s recent holiday to Russia very special that they have rated to be in they top 5 holidays of all time. Until the next one!! – Maybe the Trans Siberian Express/ River Cruise ?? – watch this space ! It is a little time after our visit, I know, but I hope it is not too late to say a huge 'Thank You' to you for making our trip so smooth and so enjoyable! We had a terrific time in both cities, enjoying the culture, the sights and the sounds! The whole visit could not have been better organised and we enjoyed every second of it!! We have spent a lot of time telling family and friends all about it and showing them lots of photos!! Will be recommending the trip to my friends. Brilliant introduction to Russia! 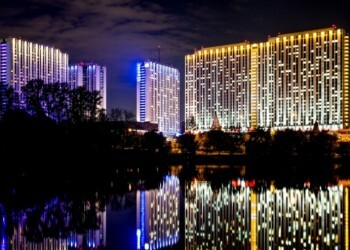 Would you like to add extra night in Moscow? 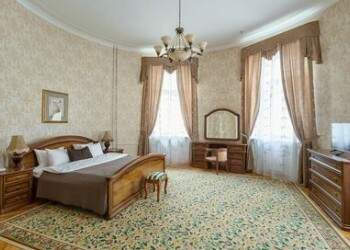 Would you like to add extra night in St Petersburg?